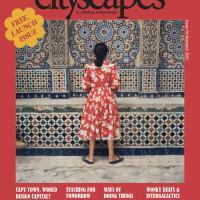 The inaugural issue of Cityscapes, launched in September 2011 featured reporting on our home city, Cape Town’s creative city aspirations have shaped aspects of how the city has been developing. Janine Stephens wrestles with the question “What does a creative city in an unequal society like South Africa look like? Renowned philosopher and academic Professor Achille Mbembe interviews Professor AbdouMaliq Simone in a candid, wide ranging conversation that covers his beginnings, work and previously unexplored key facets of his life and work. The Heliotronics, the innovative pairing of DJ/Editor/Publisher Ntone Adjabe and Composer and Musician Neo Muyanga speak to Tau Tavengwa about The Pan African Space Station, an experimental, innovative music festival. Professor Edgar Pieterse speaks to Aromar Revi about the Indian Institute of Human Settlements – an ambitious project based in India which aims to train the next generation of that country’s city leaders.